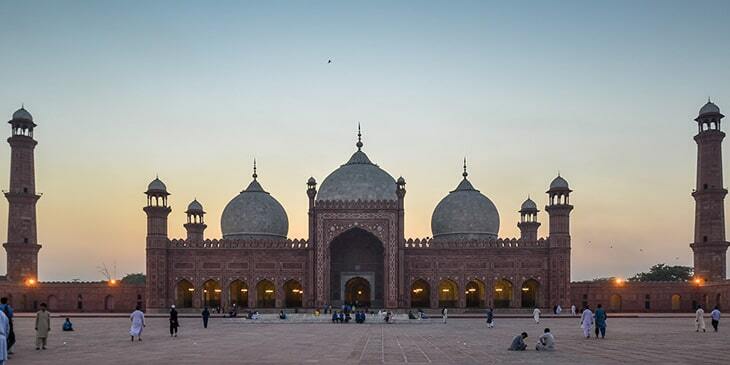 Lahore is a cosmopolitan city in Pakistan that is home to several beautiful gardens, ancient mosques, incredible palaces and captivating museums, as well as fascinating cultures. There are so many opportunities to immerse yourself into Lahore’s rich cultural heritage... Visit the five-pointed star structure Minar-e-Pakistan, designed by Turkish architect Murat Khan. The base of this national monument is shaped like unfolding flower petals, and inside the building you can explore the Quran verses and quotes from the Lahore Resolution. Head to one of the world’s largest mosques, the Badshahi Mosque constructed by Mughal Emperor Aurangzeb with red sandstone. Another famous cultural attraction in Lahore worth visiting is Lahore Fort which features thick walls decorated with glazed tiles, stunning mosaics and frescoes. Head to the Wazir Khan Mosque which is adorned with stunning murals and motifs, then continue on to one of Lahore's largest gurdwaras - Gurdwara Dera Sahib. Brightsun Travel offers a range of cheap air tickets to Lahore, so get planning now and look forward to the ultimate city break! The museums of Lahore are a must for culture enthusiasts. Visit the Lahore Museum to discover a wide range of religious manuscripts, carpets and sculptures; here you can also browse various artifacts related to the Indus Valley civilization. Another captivating museum in Lahore is the Fakir Khana Museum with one of the largest private collections in South Asia; there are more than 13,000 artifacts displayed here, including porcelain pieces, old coins and miniature paintings, as well as clothes worn by the Mughal Emperors and ancient weapons used by Sikh soldiers. Then there’s the Chughtai Museum, home to a collection of thousands of pencil sketches and etchings created by Pakistan’s celebrated artist Muhammad Abdur Rahman Chughtai; here you can witness a range of Pakistani coins and postage stamps designed by Chughtai. You can also visit the museum situated in Lahore Fort to discover several weapons including arrows, spears, swords, daggers and pistols. Book Lahore cheap flights from India through Brightsun Travel.